Microsoft last week released the latest Update Rollup for Exchange 2007 SP3. This is Rollup 4 for Exchange 2007 Service Pack 3 (SP3) and contains a host of fixes that have been released since SP3 for Exchange 2007 was released. Microsoft made the announcement here. The complete list of fixes for the patch is available here. Microsoft also advised that they will be releasing Update Rollup 5 for Exchange Server 2007 Service Pack 3 in August 2011 which is good guidance for when you need to apply this next. Ok – so how do we apply Rollup 4 for Exchange 2007 SP3 on SBS 2008? Well first up – I’ve applied this to my test server first – and from what I can see there’s been no side effects. The next test for me is to apply it to my production environment, and then later in the week I’ll apply it to customer environment. 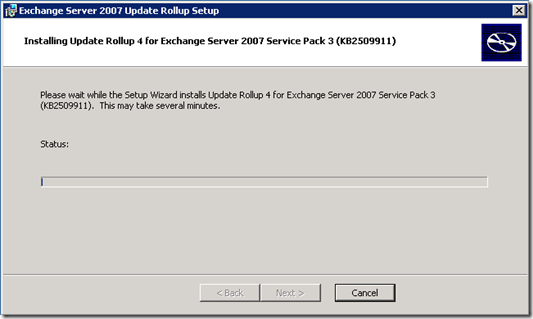 To install Rollup 4 for Exchange 2007 SP3, you must of course have Service Pack 3 for Exchange 2007 installed first. If you don’t then check out this blog post I did a while back on this subject. Next you need to download Update Rollup 4 from Microsoft – the direct download link is here – of course you will want the x64 version. Download it and save it to the desktop. 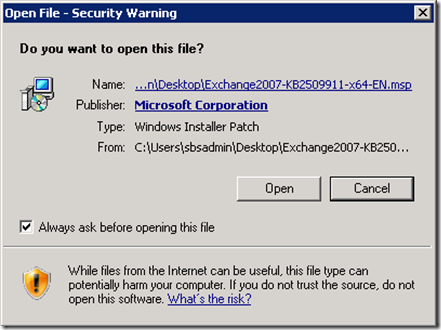 Once on the desktop – make sure that your users are disconnected from the server – I normally do my patches on a Sunday night if I can – that way I’m ready to assist on Monday morning should there be any issues. Make sure you have done a backup of the server before you apply the patch and also I normally disable any Antivirus Software as well so that it can’t get in the way. Right click on the download and select Apply. 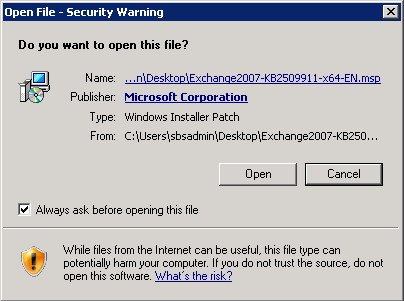 You will get the GUI that does some pre-requisite checking first – nothing to do here except wait for it to do it’s thing. 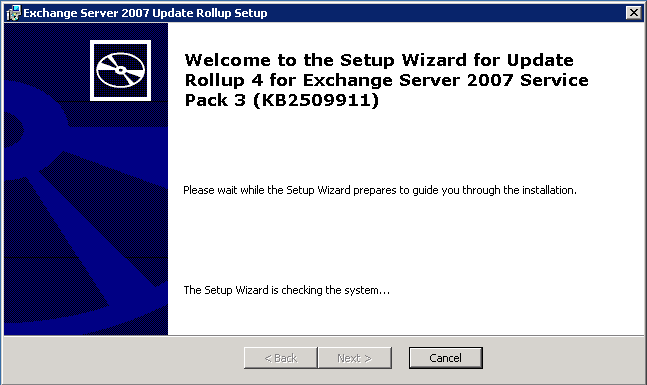 Start a Command Prompt with Administrative Privileges and then run the Update Rollup from that prompt. 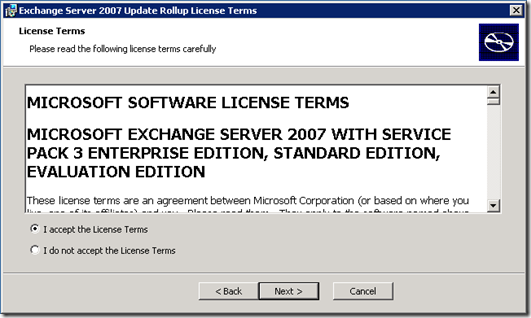 Yes – you really mist accept the license terms and then select Next to continue. Now the fun part… in the past, Exchange waits until after it’s gotten everything done then it stops the services and compiles the .NET assemblies – this means that users are off the air for longer than they need to be. Starting with this Rollup, the Exchange Team now have the update do the compilation of the .NET assemblies BEFORE it goes to stop the services etc. This should result in less downtime for the users…. I say it SHOULD result in less downtime Nothing to do at this point but wait… and wait… oh and wait. Ok – that took about 8 minutes on my production Hyper-V server – but it’s done with that. 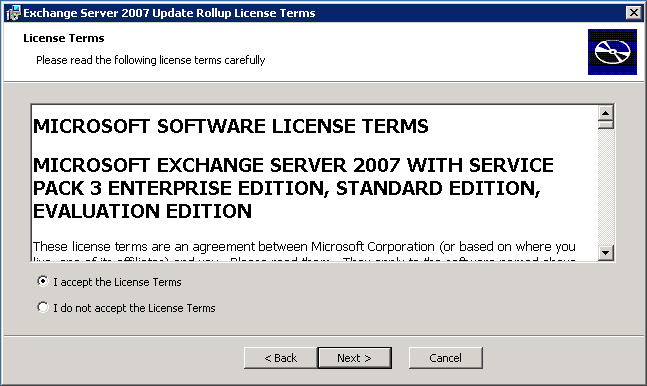 Select Next to continue. Now it’s busy stopping services – at this point your users may notice emails queuing in their outbox and the Outlook client will go into it’s disconnected state – that is to be expected. 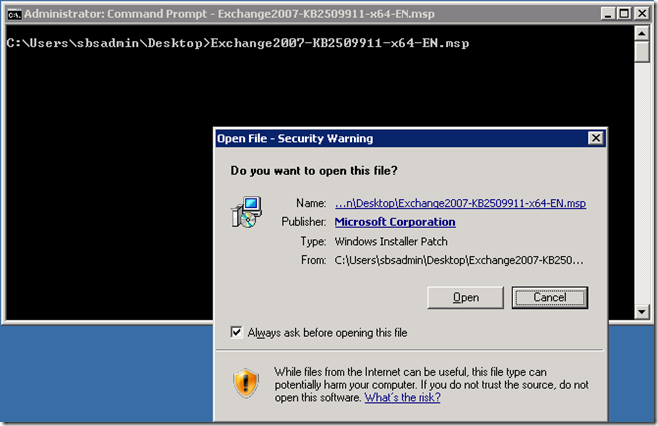 Ok – we’re copying files now… good progress. 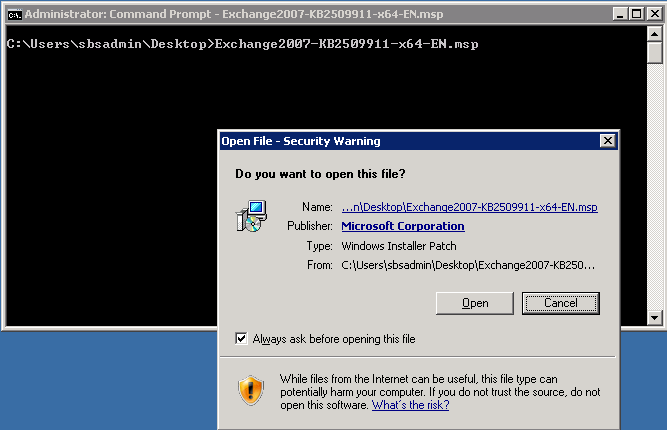 Now it’s doing more compiling – the thing I like about this screen is that it SHOWS what it’s doing – note the name of the DLL it’s working on – I’m sure that will make life easier should it stall during the installation. Well done Exchange Team. Almost done now – and I guess it’s a good sign! Woohoo – all done. All up it took around 40 minutes on my virtualised SBS 2008 server to apply this. Once it’s back up – of course you are going to test it out to ensure that everything is working fine (which it was on my server). Brill, thanks for that, just installed rollup 8 without any drama. It never fails to amaze me that Microsoft still think that we’re all telepaths (re: running from an administrative command prompt)! work and to everyone keep on tweeting!